Rhyl-based Tesni Evans has become the first Welsh woman ever to break into the world’s top 10 after the November PSA Women’s World Rankings were released. 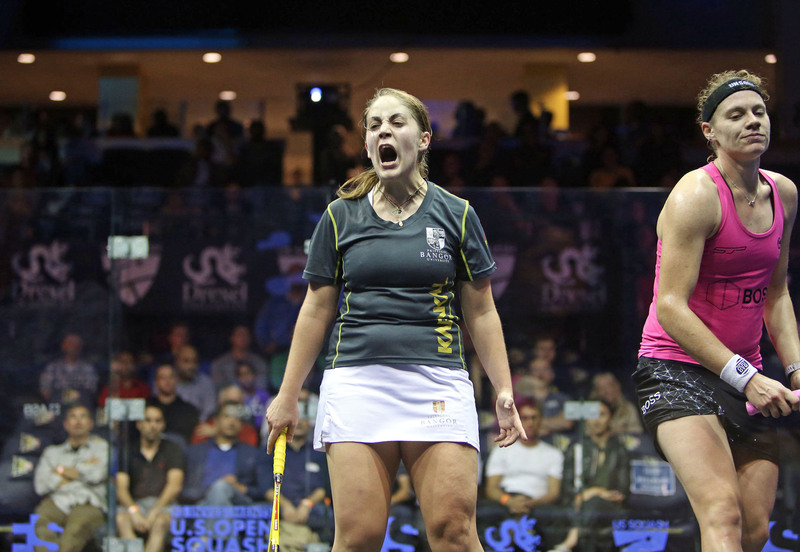 Evans made history last month in Philadelphia as she became the first Welsh player to reach the semi-finals of the FS Investments U.S. Open Squash Championships. Her performances at that tournament have helped her rise three places to No.9, making her the first Welsh player, male or female, to feature in the top 10 since David Evans in 2002. Egypt’s Nour El Sherbini marks her 23rd birthday with a 31st successive month at World No.1, but she could lose top spot to compatriot Raneem El Welily if the older Egyptian can get further than El Sherbini in the Hong Kong Open later this month. Nour El Tayeb stays at No.3 ahead of France’s Camille Serme in No.4, while England’s Laura Massaro moves up a place to end a seven-month hiatus from the top five. Massaro’s compatriot Sarah-Jane Perry rises two spots to No.6 after winning the Oracle NetSuite Open in October, while New Zealand’s Joelle King has dropped two places to No.7. Egypt’s Nouran Gohar falls to No.8 to sit a place ahead of Evans, while Malaysia’s eight-time World Champion Nicol David returns to the top 10 after last month saw her record 177-month run in the top 10 come to an end. England’s Alison Waters and Hong Kong’s Annie Au drop two places to No.11 and No.12, respectively, while former World No.6 Amanda Sobhy moves up five places to No.13. India’s Joshna Chinappa and Egypt’s Salma Hany keep their respective rankings of No.14 and No.15. England’s Victoria Lust drops three places to No.16. Australia’s Donna Lobban (No.17), Olivia Blatchford Clyne (No.18), Joey Chan (No.19) and Hania El Hammamy. 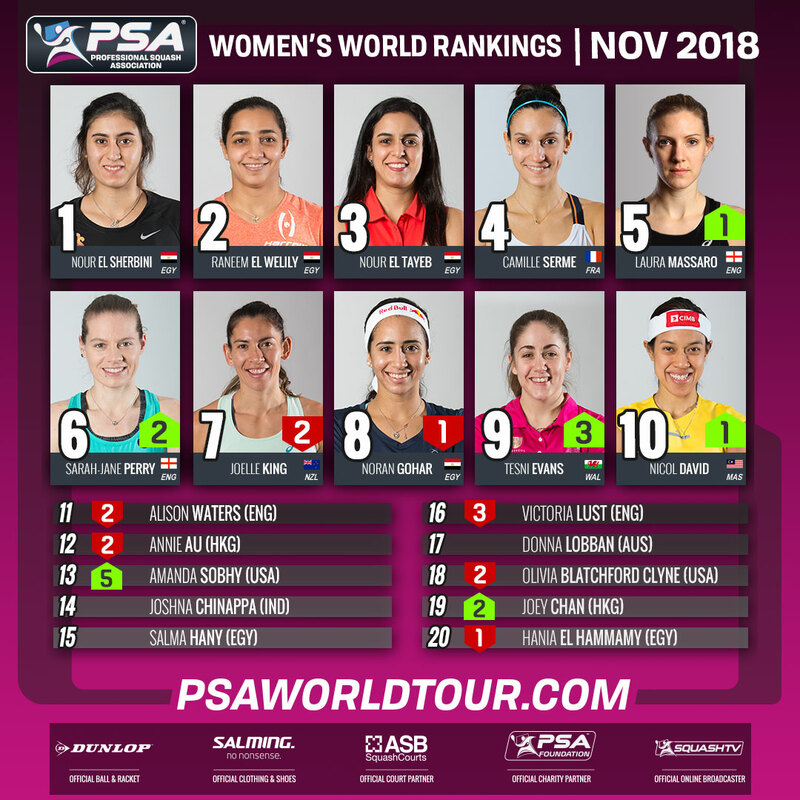 PSA Women’s World Rankings Top 20 – November 2018. Lifelong sports journalist and squash lover. Event promoter, coach, author, voice artist. Founder of World Squash Day.